Chamilo is a Learning Management System (LMS) that enables you to create a virtual campus for online and semi-online training. Chamilo has been developed as an open-source solution with GNU/GPLv3 license and is protected by a non-profit organization. Currently, it is being utilized by more than 500,000 users across various age groups in over 25 countries. Chamilo is a free e-LMS that is designed for ease of use and speed. Its key features include courses catalog, skills management, certificates generation, configurations of complex configurations, and SCORM support. Plus, it offers a shopping cart to help you sell your e-learning courses and make money. This solution accommodates over 3,000 simultaneous connected learners. Other main advantages include cloud compatibility, high availability, and quick resolution of security flaws. With Chamilo, you can effortlessly create training content, install web hosting solutions for free, track students’ results, improve learning methodologies, use the neat interface to focus on learning, utilize both synchronous and asynchronous communication channels, use practical, auditive, and visual e-learning tools as well as staff selection and serious games, benefit from the range of document management features, manage users, courses, and training cycles, utilize SOAP web services for remote management, and finally, conduct time-controlled exams. Chamilo is a free open-source solution that allows you to develop your own improvements and extensions, and you can also share them with the user community. It allows teachers to control their classes and place the content conveniently in the student’s learning environment to facilitate enjoyable learning. This product is easier to use and teach compared to most other online learning solutions. Teachers and students can effortlessly access course content. This reduces the abandonment rate for distance learners. Plus, companies can improve their chances of attaining their corporate training goals. Another highlight is Chamilo’s online editing tool that empowers instructors to develop new content at lower cost. This tool enables them to quickly create a self-assessment, add tests, and import outside content. Chamilo is an e-learning and content management system that empowers you to improve access to knowledge and education globally. 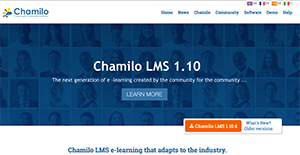 This LMS is backed by the Chamilo Association which strives to promote the software, maintain clear communication channels, and develop a network of software contributors and services providers. In addition, Chamilo’s backers aim to constantly improve this collaboration and e-learning software and increase the community of enterprise learning trainers and teachers who utilize this tool to improve their courses and teaching capabilities. This project provides a host of benefits to users including free access to a public e-learning campus, improved interface for portability with devices used in the developing world, and the offering of quality education at minimal cost. Every organization has different requirements and needs a software that can be personalized for their size, type of workers and buyers, and the specific industry they are in. For these reasons, no platform can provide perfect tools off-the-shelf. When you try to find a software system, first be sure what you want it for. Read some Chamilo reviews and ask yourself do you need basic features or do you need advanced features? Are there any industry-specific features that you are looking for? Find the answers to these queries to assist your search. There are plenty of aspects that you need to consider and these include your finances, particular business needs, your organization size, integration requirements etc. Take your time, check out a few free trials, and finally select the system that presents all that you need to enhance your organization effectiveness and productivity. How Much Does Chamilo Cost? We realize that when you make a decision to buy Learning Management System - LMS it’s important not only to see how experts evaluate it in their reviews, but also to find out if the real people and companies that buy it are actually satisfied with the product. That’s why we’ve created our behavior-based Customer Satisfaction Algorithm™ that gathers customer reviews, comments and Chamilo reviews across a wide range of social media sites. The data is then presented in an easy to digest form showing how many people had positive and negative experience with Chamilo. With that information at hand you should be equipped to make an informed buying decision that you won’t regret. What are Chamilo pricing details? What integrations are available for Chamilo? If you need more information about Chamilo or you simply have a question let us know what you need and we’ll forward your request directly to the vendor.